There could be plenty of reasons why you might be shopping for a latex mattress. Latex is known to be durable and beds made with latex tend to have good longevity. Conforming to the body, as well as adaptive, latex has a feel similar to memory foam, but can sometimes be cooler than memory foam and it springs back much faster, with less sink. Latex mattresses also come in a wide variety of firmness and some brands even customize their firmness levels, based on customer’s needs. Finally, for those looking for an eco-friendly bed, natural latex can be an environmentally friendly choice. There are many different kinds of latex mattresses on the market, however, and latex doesn’t necessarily mean natural. 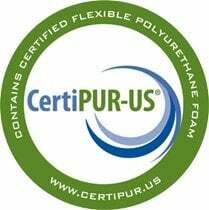 While there are brands that make mattresses from naturally sourced latex, others use a blend, or a synthetic type of latex. 100 percent natural latex mattresses tend to be quite a bit more expensive than other types of synthetic latex or foam mattresses, which is justified by the long process of harvesting the material. However, these types of mattresses come with a high level of customer satisfaction and are a great luxury option for those who can afford it. A more affordable option is to choose a hybrid latex mattress, meaning one that contains some latex, and some other materials. It all comes down to your budget and what level of firmness you prefer. We’ve done the work for you to come up with this list of the best latex mattresses, for a range of budgets and needs. You want a 100 percent latex mattress: No innersprings, foam base layers or other materials, this bed has two layers made fully of latex. You want some natural materials: Between the latex, the organic wool and the bamboo in the cover, this bed has more natural materials than most and at a great price. You want a high-end bed that doesn’t break the bank: Yes, the Ultimate Dreams mattress is still pricey. But for a bed with this level of quality and for all its features, its priced thousands of dollars below what you would find in a mattress store. Coming in at a much lower price point than similar all latex mattresses, we rate the DreamFoam Ultimate Dreams Total Latex Mattress the best latex mattress overall, for its value and high quality materials, customizable firmness level, as well as plentiful positive reviews. The Ultimate Dreams Total Latex Mattress is a 10-inch-high mattress with a removable cover. 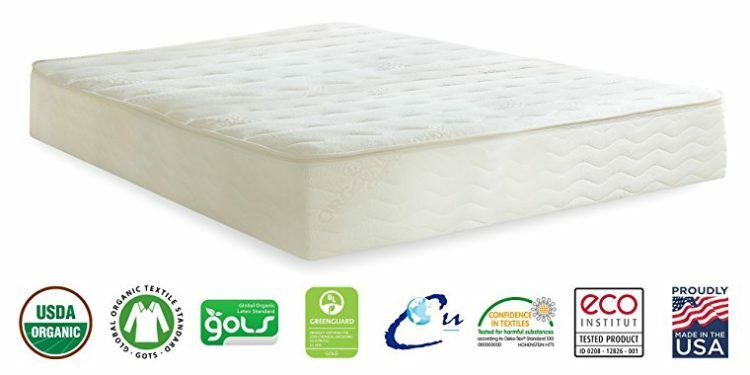 An all latex mattress, it contains two layers of premium latex. The base layer is made with a 6-inch layer of premium latex, depending on your preference. Above this is a 3-inch comfort layer of blended Talalay latex. A quilted bamboo mattress cover encases the whole bed, with a layer of natural organic wool and BreathCool polyfoam, underneath. Apart from the great price for a 100 percent latex bed, with natural materials, another great feature of this bed is DreamFoam’s customizable comfort level. After ordering, you are contacted by a sleep expert, who will ask you questions about your sleeping habits and preferences, to customize a mattress firmness that is right for you and your body type. Their mattresses range from their level 8, which gives a soft or ultra-plush feel, to their comfort level 3, considered firm, and recommended for those who want high compression resistance and best for stomach and back sleepers. Not only that, but once you purchase the mattress, the comfort layer is exchangeable (with a fee) in case you decide that your bed is too firm or too soft. Since the cover has a zipper, it is designed to provide access to the comfort layer of the mattress, which is what controls the level of firmness. Customers report this mattress is very comfortable, and the bamboo cover very soft, but it isn’t squishy or make you sink in, at all. Others mention the mattress sleeps very cool and is breathable and doesn’t retain heat. Heavier customers have recommended the company’s level 2 firmness, as it’s a bit firmer and more supportive, and one customer of average weight (150 pounds) found that level 4 works best for them, and is the best purchase they have ever made. The mattress comes with a 10-year warranty and a 120-night sleep trial period. 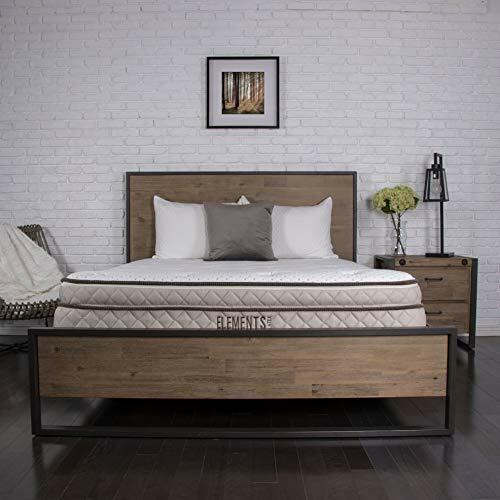 You will be hard pressed to find a mattress similar to this, with as many positive reviews, customizable firmness and luxury, natural materials, made in the USA, for a better price. 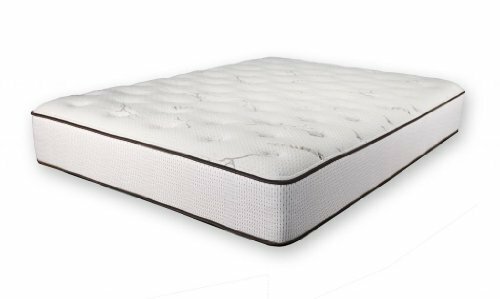 Great value, fantastic customer service, and the customizable firmness level makes us give this mattress top marks. You are on a budget: This mattress has some of the high-end features of all latex mattresses but at a fantastic price. If you’re on a budget, this could be the pick for you. You want a customizable level of firmness: Like the higher end Total Latex bed, this mattress lets you customize your level of firmness and even offers counselling from their sleep expert. You are looking for a hybrid latex mattress: This bed offers the benefit of a stable, high density foam base, with a decent 3-inch layer of latex as the comfort layer. If you like some of the high-end features of the Ultimate Dreams Total Latex bed, but don’t want to invest that much in a mattress, you might be interested in DreamFoam Bedding’s Ultimate Dreams Latex Mattress, coming in at a whopping $1100 USD less than the former. With near perfect reviews, and the same customizable comfort level as the Total Latex model, this bed gives you the comfortable, cool and conforming feel of a latex top layer, for a fraction of the cost. Available in six different sizes, the Ultimate Dreams Latex mattress is 10 inches high and features 3 inches of Talalay latex foam as the comfort layer, designed to be cool and breathable and as we mentioned, available in a variety of firmness levels. And like the previous mattress, this bed also comes with a 6-inch base support layer, this time made from high density convoluted foam. The convoluted structure of this base layer is designed to promote airflow and the cooling features inside the mattress are heightened by the quilted bamboo cover, which is naturally antibacterial and supposed to be more absorbent and cooler than cotton. A heavier customer of 250 pounds is reporting the number 6 in the company’s firmness level works great for him, even though this is considered medium plush, and he can get in and out of the bed with ease, with no sinkage and great edge support. Another customer has mentioned that the mattress supports his and his wife’s body weight perfectly, and they have been sleeping deeper than ever. A few customers have reported sinkage and sagging over the course of a few years, but it’s hard to say whether this has to do with not getting the right firmness level for their weight or if it is a matter of a fault within the mattress. However, most people are reporting that this mattress stands the test of time and is most are still enjoying restful sleeps, years later. Like the other DreamFoam mattress, this bed comes with a 120-night sleep trial so you can make sure you are getting the right level of firmness for you, and a 10-year warranty, so if you do have any problems with sagging or aging, we’re sure the customer service team of the company will help you out, as they have rave reviews. You like the feel of an innerspring mattress: If you’re looking for the cooling cushion of latex, but like the stability of innerspring mattresses, look no further – this could be the bed for you. You don’t want to spend too much for latex: While not a 100 percent latex mattress, this hybrid features a decent layer of latex on top of the innerspring layer, and at a much lower price than all latex beds or even some other hybrids. You want some natural materials: This bed features 100 percent all natural latex with no fillers and no blends. Coupled with the organic cotton cover, there are a few natural, luxury materials in this bed. 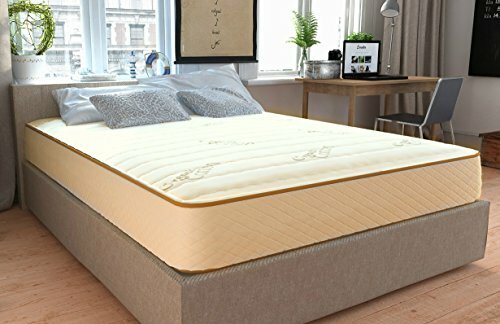 For those looking for the benefits of cooling and body conforming latex, but prefer an innerspring mattress feel, the Eco Terra 11-inch Luxury Latex mattress offers a high-quality mattress made with natural latex, for a decent price. The mattress comes in two firmness levels, medium and medium firm and a range of six different sizes. A bit firmer than an all latex mattress, the innersprings of this bed provide a solid and resistant feel, with no sinkage. This bed is made with a 100 percent natural latex layer, that is hypoallergenic and has little to no off gassing. 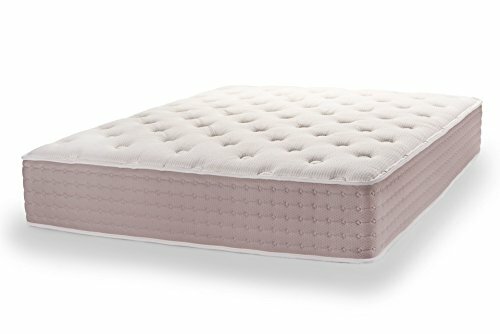 It rests on top of 1057 (for the Queen sized) individually fabric encased coils that are designed to reduce motion transfer and according to the company, provides a level of durability that is 26 percent stronger than a foam base. The individual coils are each calibrated to provide resistance to the different areas of the body, and the mattress is made to be comfortable in any sleep position. The coils around the edge of the bed are calibrated to be firmer, so they are more supportive when sitting or sleeping on the edge. The cover is made with GOTS Certified organic cotton, which gives the bed a breathable and cool feel. Users report that this bed feels resilient and responds quickly to regain its shape when you move on it, unlike memory foam that takes longer to respond and regain its shape. A larger, side sleeping customer of 325 pounds reports that he is having zero issues with this bed – it is supportive and he has been having great sleeps on it. However, a few customers find even the medium firm bed a bit too firm, when sleeping on their side, and a couple have found relief with an extra mattress topper. Overwhelmingly, though, most customers are happy with this mattress and it is made to be “middle of the road” in terms of firmness, or about a 5.5 on a scale of ten for the medium firm bed. The company claims to be America’s best priced Queen mattress made with 100 percent natural latex and we have to agree with them. They also have a 90-night sleep trial period and a 15-year warranty. You want all natural materials: With three, all natural, organic latex layers, organic cotton cover and natural wool inside the bed, even at its higher price point, this is still thousands less than an all-natural bed inside a showroom. You want a customizable bed: This bed comes with a wide variety of sizes and comfort levels, both provided by the company, or available for you to adjust at home by yourself. With six different firmness levels in each mattress, you can take out the layers and move them around to see what works for you. You don’t mind spending more for a long-term investment: Yes, the PlushBeds Botanical Bliss Mattress is quite pricey, but with a 25-year warranty and near 100 percent customer satisfaction level, chances are you are making an investment on a bed that is going to last you years. For those willing to splash out on a high-end luxury latex mattress, the PlushBeds 10-inch Botanical Bliss Latex mattress justifies its price with its perfect reviews. A fully natural bed, this mattress is made for those who don’t mind paying for all high end, natural, eco-friendly materials, that are the best money can buy. The mattress starts with a breathable organic cotton cover, which is zippered to accommodate the different firmness levels that the company offers. The cover is also knit as opposed to woven, which is supposed to be more breathable and promote better airflow. Inside the mattress are three different layers of organic latex, each with their own level of firmness, by adjusting which layer is on the top of the mattress, customers can customize their level of firmness, or go for one of the company’s already established comfort levels. Since there are six possible firmness levels in each mattress, customers can arrange the layers in the way that works for them. If this sounds two complicated, the company’s two most popular firmness levels, medium and medium firm accommodate most customers, with medium working for all types of sleepers and working for 80 percent of sleepers and medium firm working best for back and stomach sleepers who need a bit of extra support. 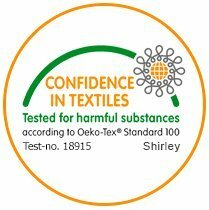 In terms of off gassing with this bed, there isn’t any, as the mattress meets the highest standards for natural materials and the company claims less than 1 percent of US mattresses can match their level of certifications. If you want to read more about the PlushBeds 10-inch Botanical Bliss Mattress, you can find our full review with more details here. You want a lower profile mattress: If you have trouble getting in and out of a high bed in the morning, this might be a good choice for you. At only 9 inches high and not saggy or soft, this bed is easy to get up from. You want a flip-able bed with two comfort levels: Not all that common in a latex mattress, this bed offers two comfort levels of firmness so you can find what works for you. You want natural, high end materials for a good price: All natural latex and a 100 percent organic cotton cover means that this bed has some of the features of a much more expensive natural bed. Don’t like the idea of innersprings but can’t afford an all latex bed? Then the Sleep EZ USA Roma Natural Latex Mattress might be good for you. We rate it as our top hybrid latex mattress because while it is a hybrid, it offers a very thick layer of latex compared to other hybrids, at 6 inches, giving great value and superior comfort. On top of that, it contains a number of all natural materials, giving this mattress a bit of high end luxury, for a budget price. Around the 6-inch layer of premium 100 percent natural Dunlop latex is 1.5 inches of Certi-PUR US certified foam, on both sides, making up a total of 9 inches of height. This lower profile makes this bed a great choice for those who have trouble getting in and out of higher beds, or have trouble getting out of memory foam beds that sink too much. The cover is knit and therefore breathable and made from 100 percent organic cotton. We also love the two comfort levels in this fully flip-able mattress. It has a plusher side for side sleepers and a firmer side for stomach and back sleepers. They also offer customers completely free shipping, free returns and a totally free money back guarantee as well as a 20-year warranty. Customers are extremely satisfied with the level of customer service at Sleep EZ USA, and they are also happy with the two sides to this bed, that can accommodate most customers. Users are reporting very quick spring back when they move or turn compared with memory foam, and they are also reporting a very even and supportive feel to the mattress, with no sinkage. Some customers mention that even the plush side isn’t all that soft, so if you are looking for that sinking in feel that memory foam gives, you aren’t going to find it here. Instead, this bed sleeps cool, you float on top and it’s supportive and on the firmer end of things, but not hard. Any issues are quickly resolved by the company owner, who you deal with directly and for a bed that is mostly latex, with other high end natural materials, this is a steal. As we can see here, latex beds come in a number of styles and a wide range of prices. Whether you want a completely plush, all natural high end luxury latex bed or a bed with some latex for those on a budget, this list is sure to have something for everyone. 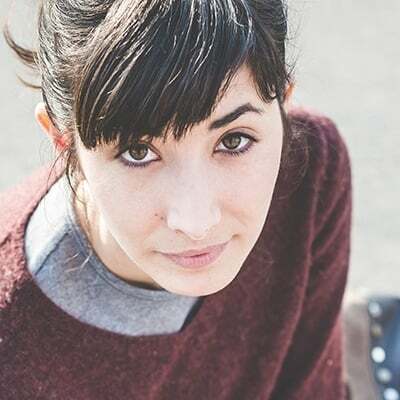 Find out which level of firmness works for you and think about what type of sleeper you are. Talk to one of the sleep specialists at these great companies and let them suggest the perfect bed.